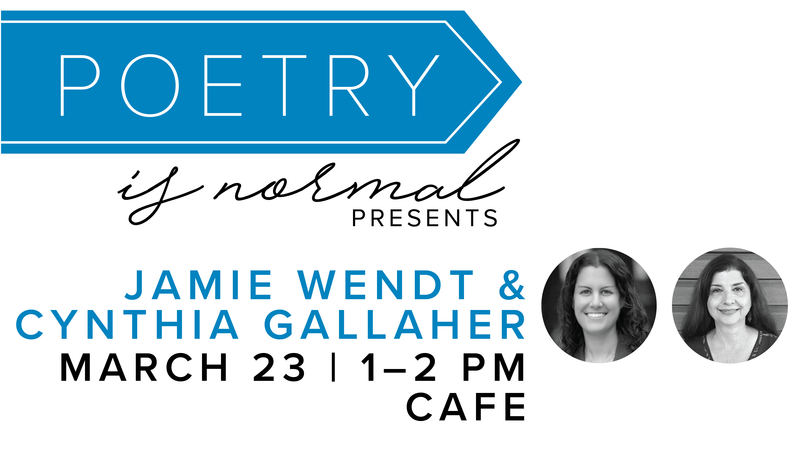 Poetry is Normal Presents Jamie Wendt and Cynthia Gallaher on Saturday, March 23 from 1:00 to 2:00 pm in the Cafe. Two Chicago poets come to Normal to read us their new work. Jamie Wendt is the author of Fruit of the Earth, a poetry collection published by Main Street Rag Publishing Company. She graduated from the University of Nebraska Omaha with an MFA in Creative Writing, and she received a Bachelor of Arts in English and a Bachelor of Science in Secondary Education from Drake University. Her poetry has been published in a variety of literary journals, including Lilith, Raleigh Review, Minerva Rising, Third Wednesday, and Saranac Review. Her essays on Jewish writing have been published in Green Mountains Review and the Forward. She contributes book reviews for the Jewish Book Council, Literary Mama, and other publications. Wendt teaches high school English and lives in Chicago with her husband and two children. Cynthia Gallaher, a Chicago-based poet and playwright, is author of four poetry collections, including Epicurean Ecstasy: More Poems About Food, Drink, Herbs and Spices (The Poetry Box, Portland, 2019), and three chapbooks, including Drenched (Main Street Rag, Charlotte, N.C., 2018), poems about liquids. She made a 10-city book tour with her nonfiction guide & memoir Frugal Poets' Guide to Life: How to Live a Poetic Life, Even If You Aren’t a Poet, which won a 2017 National Indie Excellence Award. Poetry is Normal Presents is supported by the Normal Public Library Foundation.